Founded in 1930, Nels Johnson Tree Experts is a family owned and operated company devoted to the care and maintenance of trees and plants throughout Northern Illinois and the Chicagoland area. The founder of our company, Mr. Nels J. Johnson Sr., discovered his love of nature as a boy in Skane, Sweden. The rich earth and dense forests of southern Sweden inspired him to successfully specialize in botany. Determined to follow the American dream, Mr. Johnson arrived at Chicago’s North Shore well-trained in horticulture and armed with the ability to speak Swedish, Latin, German, and English. Mr. Johnson became an Illinois state instructor of plant science, conservation, and forestry, and judged the world-renowned Chicago World Flower Show for four years. Nels Johnson became the father of the Illinois Tree Expert License Law and was appointed chairman of the Illinois Tree Expert Examining Board. He also became founder and president of the Associated Arborists of Illinois. That same year he was awarded the Charles Hutchinson Medal by the Chicago Horticultural Society. Subsequently, Mr. Johnson was appointed to the Governor’s Advisory Council. Our team of professionally trained and certified arborists, tree workers, and safety specialists offer a wide range of services – from diagnostics to tree and stump removals. Our experience includes servicing residential homes, municipal and industrial properties, schools, parks, and golf courses. 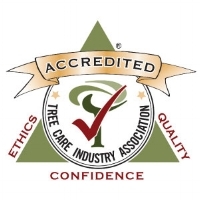 The proud tradition of expert tree and plant care and unmatched customer service created in 1930 continues to flourish. The third generation of the Johnson family carries on Nels' tireless devotion to maintaining and improving the health and beauty of nature.